You can’t typify an English garden. It has evolved so much over the years that quantifying it as just one thing would miss out on a part of its rich history. 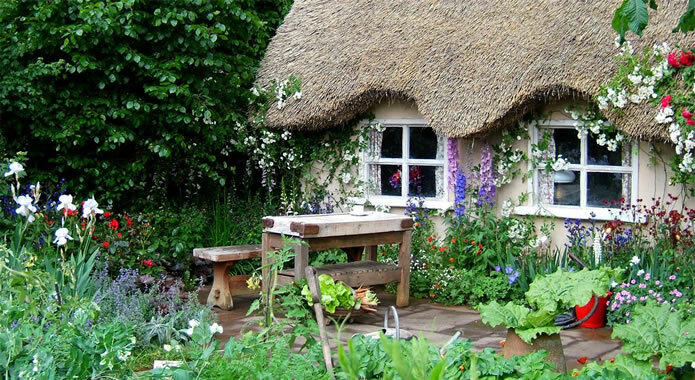 Gardens have been important parts of the home since we starting building mud huts to sleep in and have evolved into multi use areas that offer so much more than flower picking and vegetable growing. Below you will find a list of the changing styles of British gardens. There is a number of surviving Roman gardens in Britain today. Sussex’s Fishbourne Roman Palace has been partially restored to its former glory and can still be visited to this day. It shows of the standard Roman garden design of neat low down hedgerows and expanding walkways which would twist around the entire expanse of the garden. The gardens were designed to show off gardening skill. These were formal gardens which could be seen as favouring style over substance. These gardens were some of the first to have decorative areas with items like vases, rather than just flowers and greenery. Sundials were first introduced to gardens as ornaments during this time too. The gardens of this period were typically found within monasteries. They were small and compact spaces where Monks would grow vegetables in the ground and reflect on the day and their duties for God. These courtyard areas typified the style of gardens from this time and gardens weren’t for the enjoyment of the outside world; they were only for the use of the Monks or any occasional esteemed visitors, such as nobility or esteemed clergymen. Tudor Britain showcased some of the most extraordinary topiary skills that had ever been conceived. Although these gardens were once only available to nobility, everyone can now enjoy what remains of them centuries on. Thanks to the National Trust many gardens have either been restored to their former glory or have been renovated to at least highlight an aspect of their former style. This was also the period where courtyard gardens really came back into prominent use. The privacy that they could provide was especially desirable for the home owners of the time. These gardens were also designed to bring the inside decor outside, providing continuity wherever you were on your land. The gardens of Stuart Britain followed on from the Tudor gardens with their style, but also looked to Europe for inspiration. The high walls or expansive hedgerows kept the privacy that was found in the Tudor gardens. Gardeners of the period looked at the formal styles of French and Italian gardens when designing their English counterparts. Impressive topiary again featured heavily, but this time alongside expansive courtyards. During this period gardens also became more accessible to the lower portions of society. Landowners sectioned off portions of their land to try to emulate the gardens of the grander estates in the country, whilst farmers also sectioned off areas of their own land. These gardens were more about space. The Georgians were of the impression that bigger was better, so they landscaped their gardens to reflect that. They would have large grassy areas with a number of courtyards positioned at their corners to provide areas for quiet contemplation. The larger expanses of land would often be used to access any parkland that was attached to the estate. These areas were often used for hunting, which was a popular activity in many country manors and estates at the time. Many Georgian gardens also had patio areas where they could dine and entertain during the warmer months of the year. The gardens of Victorian Britain put more focus upon the plants and shrubbery used. Large areas of flowerbeds would decorate significant estates, but even those from the smallest homes in Britain had access to public gardens which would be decorated with roses and perfectly pruned hedges for them to enjoy. Hampton Court Palace was one such place that had beautiful and expansive gardens. Some of the courtyards that can be found within the palace’s walls have even been used by royalty in the past. Queen Victoria’s children all learned how to tend to plants and cut flowers in these gardens. She was said to have loved spending time in the Hampton Court gardens. The gardens of the period were cheerful and happy and flowers grown were often bright and colourful. Wealthier households would grow exotic plants within greenhouses. Orchid growing became a popular pastime during this age. The twentieth century saw the beginning of many of the gardens we still have today. Flower beds and borders that are easily maintained became a large part of the busy gardener’s life. This became an important feature, during a time where luxuries had been affected by both World Wars. The gilded days of Victorian and Georgian gardens now had little place in this more modern society. The end of this century saw the implementation of patios and decking areas. Multi purpose living became one of the desired features of the home. Gardens were now seen as more of an extension of living space rather than an addition to it. The gardens in Modern Britain are all about expressing yourself and what your garden is supposed to be used for. Regardless of size or location there is a garden available for you. Courtyard gardens are often positioned in urban spaces as they offer more space to city dwellers and also add an extra amount of privacy to areas that are notoriously cramped. All of the different garden styles have one thing in common, they all contain included courtyards. Courtyards have become one of the most enduring aspects of English gardens. Regardless of the changing preferences of the topiary, hedgerows and pathways they have never been far away. Now enjoying a renaissance period as the urban garden of choice, their enduring appeal will no doubt see them feature within British gardens for centuries to come. It is unlikely that we will stop visiting the beautiful courtyards housed within Britain's magnificent stately homes either.